Tens of thousands of people have held protests in Cairo against Egyptian President Mohammed Mursi, who last week granted himself sweeping new powers. Flag-waving demonstrators chanted slogans accusing the president and the Muslim Brotherhood of betraying last year's revolution. On Monday Mr Mursi sought to defuse the crisis by saying the decree granting him new powers was limited in scope. However, his opponents want him to withdraw the measure completely. Ahead of Tuesday's rally, opposition activists clashed with police protecting the nearby US embassy. A protester, who was in his fifties, died of a heart attack after inhaling tear gas. 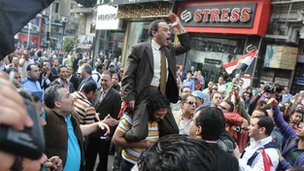 Activists later converged on Tahrir Square - the main focus of the revolution that ousted President Hosni Mubarak - for one of the largest demonstrations to date against Mr Mursi. The people want to bring down the regime," marchers chanted, echoing slogans used in last year's protests. "We don't want a dictatorship again. The Mubarak regime was a dictatorship. We had a revolution to have justice and freedom," protester Ahmed Husseini was quoted as saying by Reuters news agency. "The main demand is to withdraw the constitutional declaration," said Amr Moussa, a former Arab League chief who has joined the opposition. Protests were also held in Alexandria and other cities. The president's decree - known as the constitutional declaration - said no authority could revoke his decisions. There is a bar on judges dissolving the assembly drawing up a new constitution. The president is also authorised to take any measures to preserve the revolution, national unity or safeguard national security. Critics say the decree, issued last Thursday, is an attack on the judiciary. It has sparked violent protests across the country. On Monday Mr Mursi told senior judges that the scope of the measure would be restricted to "sovereign matters", designed to protect institutions. The Muslim Brotherhood, which supports President Mursi, said it was postponing its own demonstration, originally due on Tuesday, to avoid "public tension". 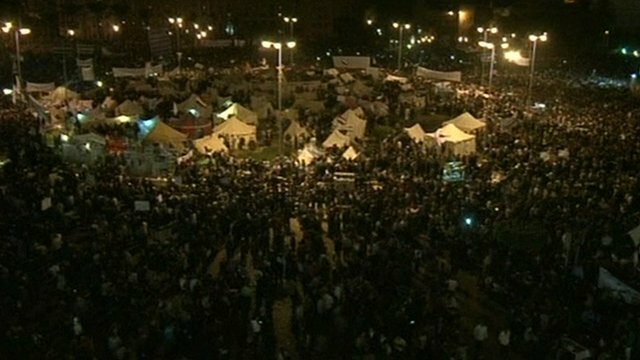 The BBC's Jon Leyne in Cairo says the postponement is another sign that the government wants to defuse confrontation, but it remains to be seen whether it ends the days of angry and sometimes violent protests. Egypt's union of judges, known as the Judges Club, rejected the president's statement, calling it "worthless" and said they would continue to suspend work in courts.